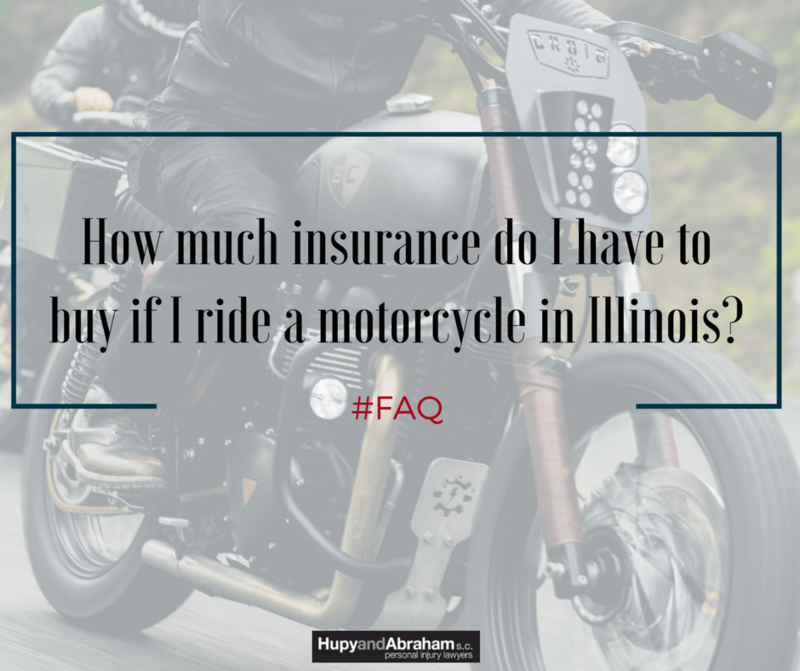 Illinois Motorcycle Accident Insurance Requirements | Hupy and Abraham, S.C.
How much insurance do I have to buy if I ride a motorcycle in Illinois? Motorcycle accidents are unpredictable. If you could predict when a crash might occur, then you would avoid it. Since you can’t do that, Illinois law requires you to carry a minimum amount of insurance to protect yourself and others from the financial consequences of a motorcycle accident. Additionally, optional insurance coverage is available to further limit your potential liability in case of a crash. $25,000 for injuries or death of one person in a motorcycle crash. $50,000 for injuries or death of more than one person in a motorcycle crash. $20,000 for the property damage incurred in a motorcycle crash. Of course, these are just minimum amounts and they are subject to change. Injuries and property damage in a single motorcycle accident may be much higher than the minimum amounts required by law. Accordingly, it is important to consider purchasing additional insurance to protect you from financial ruin after a bike wreck. Comprehensive insurance. This involves harm to your bike that occurs for reasons other than an accident. These reasons could include vandalism or a fire, for example. Collision insurance. This covers repairs to your own bike after an accident. Uninsured motorist coverage. This type of insurance would pay for your accident costs if you are involved in a hit-and-run and the other driver can’t be identified, or if you are involved in an accident with a driver who does not have insurance. You may also be able to purchase insurance that pays for your own medical costs or custom parts of your bike if you are involved in a crash. Generally, it is important to purchase as much insurance as you can afford and to make an educated decision about insurance coverage that provides you with the protection you need if you are involved in a crash. Because finances can be uncertain after a motorcycle accident, we’d like to encourage you to contact our firm if you believe someone else is responsible for your injuries and other accident losses. Let us hear your story during a free, no-obligation consultation; we would be happy to share our insights about your potential insurance claim. How can I get a copy of a police report after an Illinois motorcycle accident?